The carriage at sea of coal of all types can produce potential flammability hazards. All grades of coal emit methane, which is odourless, lighter than air, and has a flammability range of approximately 5% to 16% by volume. It can be detected with an explosimeter. Particular attention must be paid to providing effective surface ventilation to circumvent the build up of methane gas, especially during times of following wind and in the period immediately subsequent to an enforced shut-down of surface ventilation due to adverse weather. Some types of coal are susceptible to spontaneous combustion, where the presence of oxygen assists the temperature of the coal to rise to a point at which self-ignition occurs. These coals are referred to in the IMSBC Code as “Self-heating Coals” and the mandatory recommendations of the code are to be followed. Spontaneous combustion is caused: when some grade of coal cargos are carried in a damp condition. The centre of these cargos will have very little ventilation to allow for cooling effect, therefore the natural heat generated can build up to such a degree that combustion takes place. Due to the restriction of oxygen, the cargo will only smolder until part of the cargo is removed, then admitting additional air will cause the cargo to burst into flames. 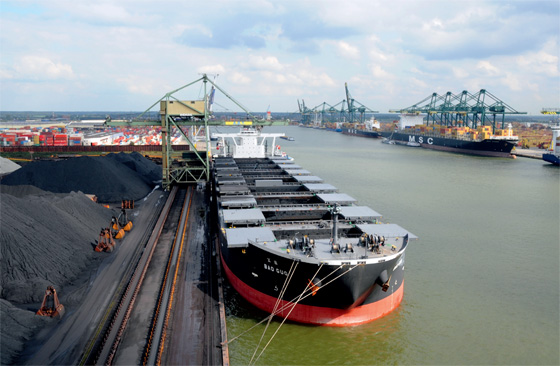 Cargo temperatures in any hold containing coal are to be monitored and recorded . Temperature readings should be taken during loading and throughout the voyage on a daily basis. A sustained increase in cargo temperature or any cargo temperature exceeding 40 Deg C is to be reported to the management ashore. Where coal is stowed in holds adjacent to bunker tanks, this must be in accordance with the requirements of the IMSBC Code. Coal should not be stowed adjacent to hot areas. Hold atmospheres must be tested for methane, carbon monoxide and oxygen immediately upon completion of loading, recording the results and the time they were obtained. Repetitive tests must be carried out daily on the voyage. Gas monitoring should be done through proper fittings in the holds as described in the IMSBC Code, not through open accesses or covers. If, for any reason, such as bad weather, daily measurements could not take place, an appropriate entry should be made in the Deck Log Book. Equipment to measure methane, oxygen and carbon monoxide in the cargo holds must be in good working order and calibrated before use. Any recordings of methane content in excess of 10% of the lower explosive limit (LEL) are to be reported immediately to the Company. Surface ventilation is to be effected at all times when carrying coal, weather permitting, unless stated otherwise in the IMSBC Code or where heating is detected. When the shipper advises that the cargo is likely to self-heat or analysis of the atmosphere in the cargo space indicates an increase of carbon monoxide concentrations, additional precautions are required by the IMSBC Code, which should be followed. IN cases of likely self-heating the management office must be contacted for guidance. The status of hold ventilation (“O” Open or “C” Closed) should be recorded . Entries are to be made in the Deck Log Book when any change in surface ventilation procedures is effected and the reasons for such changes. Strict attention must be paid to ensuring that methane build-up does not take place during period of following wind, when surface ventilation may prove ineffectual. If methane emission has been detected, the monitoring frequency is to be increased during such periods. Under no circumstances is ventilation to be attempted within the bulk of the cargo. Particular care is to be exercised in respect of any work being conducted on deck when methane concentrations have been detected in any hold. Following periods of enforced suspension of surface ventilation due to adverse weather, no work whatsoever is to take place adjacent to hatches save that strictly necessary to reopen the vents until the methane concentrations in all holds has been established and, where necessary, reduced below 10% of the lower explosive limit. PH Value of any liquid in the bilges should be recorded when applicable. Equipment to measure pH value of cargo space bilge samples should be onboard prior to loading. No sources of ignition must be present outside the accommodation when coal is being carried or handled. Smoking Regulations are to be complied with, and the use of naked lights are forbidden forward of the accommodation. All electrical cables and components in cargo spaces and adjacent enclosed spaces are to be free from defects. Such cables and components are to be safe for use in an explosive atmosphere or positively isolated. Care must be taken to see that methane is not allowed to enter accommodation or store spaces. The degree of cleaning required will depend on the next cargo to be loaded. Coal following coal will obviously not require the level of cleaning that a grain cargo following coal will need and ship's officers will be guided by the cargo instructions they receive. When washing holds care must be taken to ensure that neither cargo nor dunnage debris is drawn into the bilge suction. Thorough sweeping of residues must be carried out before washing down and all sweepings removed from the hold. Bilge well covers should not be removed during hold washing, otherwise small pieces of debris may be drawn into the suction causing damage.